After my wooden dish and my heart magnets and Free Printable Christmas Tags, I bet you’re beginning to think I might be slightly intoxicated with glitter. I do have it all over my office right now, so that is a definite possibility. Yes. I’m a glitter fiend. And I know I’m not the only one, right? 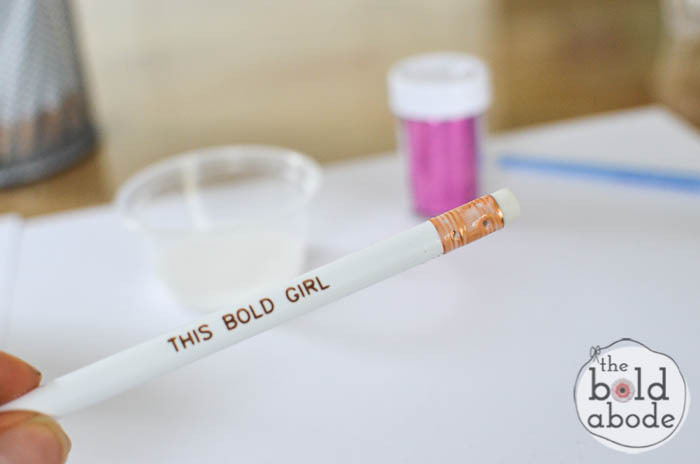 This project is quick, easy and elevates your pencils to runway status. I buy all my personalized pencils from Oriental Trading Company. They are really great pencils. They mark well and actually erase. I loathe when pencils won’t erase, don’t you? You go to correct a stray mark and the eraser just makes an orange stripe on the paper? I want to tear my hair and my eyebrows out. And I need my eyebrows, kwim? But these are great. I bought some for both boys for school with their names on them this year. Guess what? They haven’t lost them. In fact, my oldest, Morgan, has most of them left in my storage cabinet in my office. This time last year he’d gone through about 72 pencils. NO JOKE. 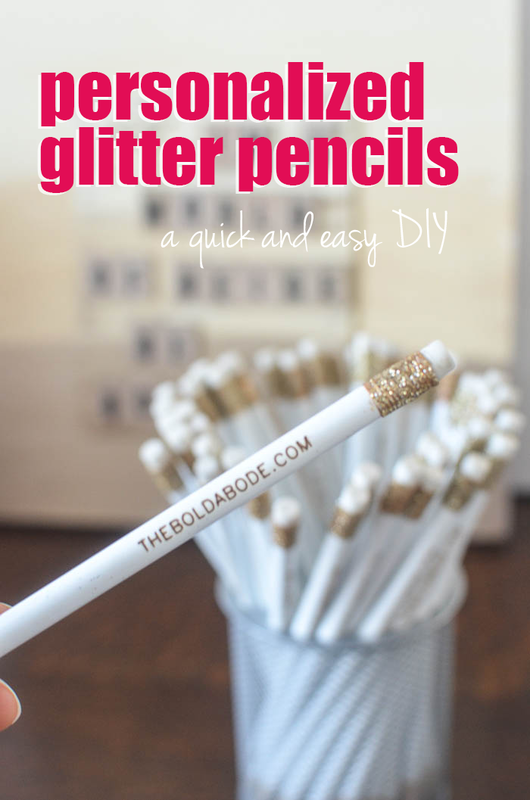 How to Make your own DIY Glittered Pencils. 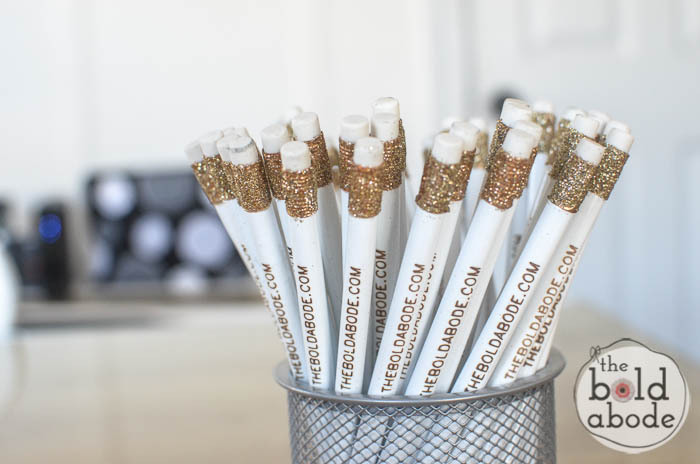 So, once you have your personalized pencils all you need is some glitter and Mod Podge and a paint brush. I don’t know why that pink glitter is there. I didn’t use it. But it sure it pretty, isn’t it? 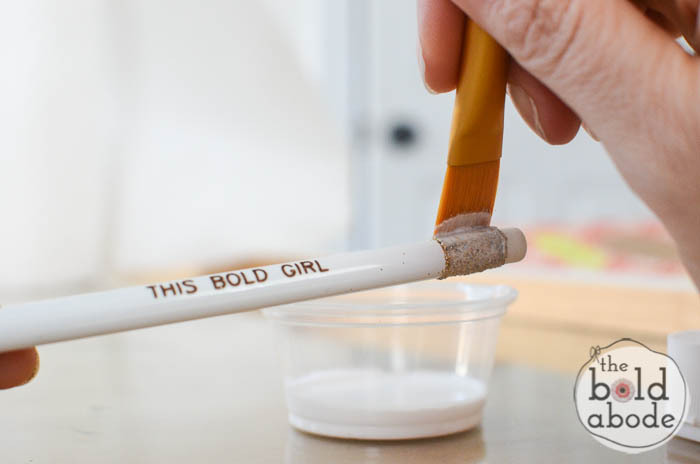 First, paint some Mod Podge on the metal part of the pencil. I’m 99.9% certain that part has a name… kinda like that place between your lips and your nose? It has a name, but nobody knows it? Or do you? You might be the one person I know that has a wicked smart brain that remembers those weird names of strange places on the human body. Or pencils. 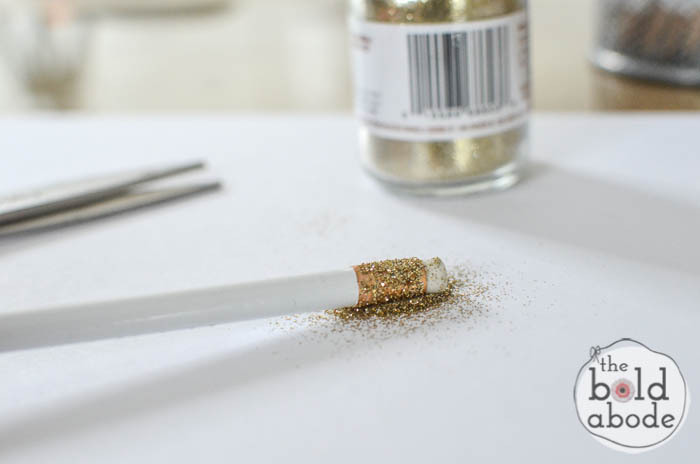 Next, roll your pencil in some glitter. Or pour the glitter over the glue. Either way works fine. Rolling it gets the glitter smushed in better, but pouring it keeps a bunch of glitter off the white part of the pencil. So you just have to decide which is less annoying. Let the glitter dry thoroughly. Then paint back over it with more Mod Podge. 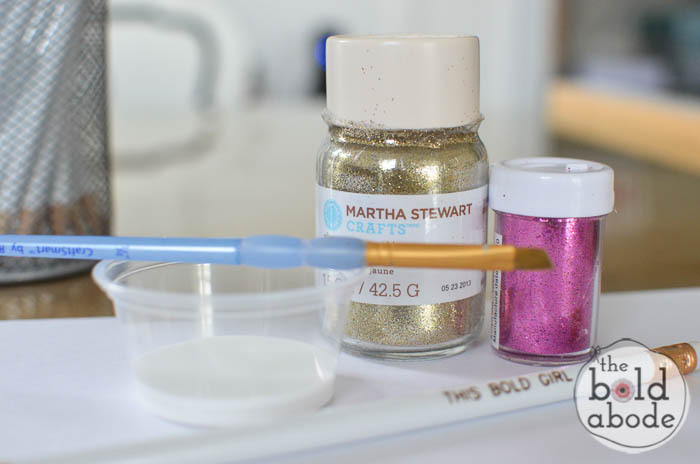 This seals the glitter so it won’t come off all over your paper when you are trying to write that grocery list. Let the pencils dry for at least 24 hours before using. What a fantastic present these would make for the glitter fiend in your life! What say you? Have you already bought your personalized pencils?